August “Auggie” Jones lives with her Grandpa Gus, a trash hauler, in a poor part of town. So when her wealthy classmate’s father starts the House Beautification Committee, it’s homes like Auggie’s that are deemed “in violation.” Auggie is determined to prove that she is not as run-down as the outside of her house might suggest. Using the kind of items Gus usually hauls to the scrap heap, a broken toaster becomes a flower; church windows turn into a rainbow walkway; and an old car gets new life as spinning whirligigs. 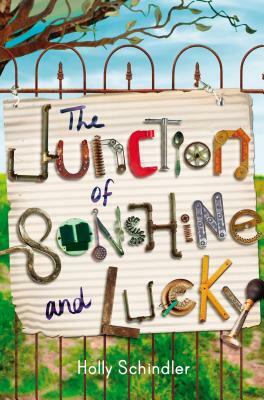 What starts out as a home renovation project becomes much more as Auggie and her grandpa discover a talent they never knew they had—and redefine a whole town’s perception of beauty, one recycled sculpture at a time. Auggie’s talent for creating found art will remind readers that one girl’s trash really is another girl’s treasure. Holly Schindler taught music lessons after she graduated from college, and decided to become a writer to connect with the kids and teens whose music once filled her home. She lives in Springfield, Missouri.